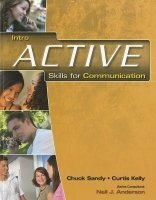 ACTIVE Skills for Communication is an exciting new three-level series that develops learners' speaking and listening skills. The series builds on Neil J. Anderson's ACTIVE approach (see also ACTIVE Skills for Reading 2nd Edition) to help learners become more fluent, confident-and active-speakers of English. Each unit contains easy-to-follow, step-by-step activities that lead toward a major speaking task. The tasks are based on real-life situations, and are designed to increase self confidence and foster positive attitudes towards learning English.